TWO instrumental groups and several soloists from the Minster School scored notable successes at the Nottingham Music FestivaL on Friday 20th November. The Junior Chamber Orchestra, which was only formed in September, and which has an average age of just under 11, was awarded the William Garnett Trophy for string groups under the age of' 16. The Fanny Davies Trophy for string groups' under the age of 11 was awarded to a group of five girls from the Junior Department of the school. Both groups were directed by Mr T. S. Gill, the Head of the Junior Department. Members of the Chamber Orchestra are: Jane Gill, Ashley Williams, Elizabeth Jenner, Alexander Marshall, Tina Wastie, Helen Baker, Fiona Johnson, Anna Croad and Helen Peak ~ Violins; Philip Collin and William Harrison -- Violas; Kate Gill, Lucy Beckett, Andrew McIntosh and Paula Derbyshire - cello. The Junior Department Quintet comprises: Elizabeth Jenner, Anna Croad, Helen Baker and Fiona Johnson - violins; Kate GiII- cello. 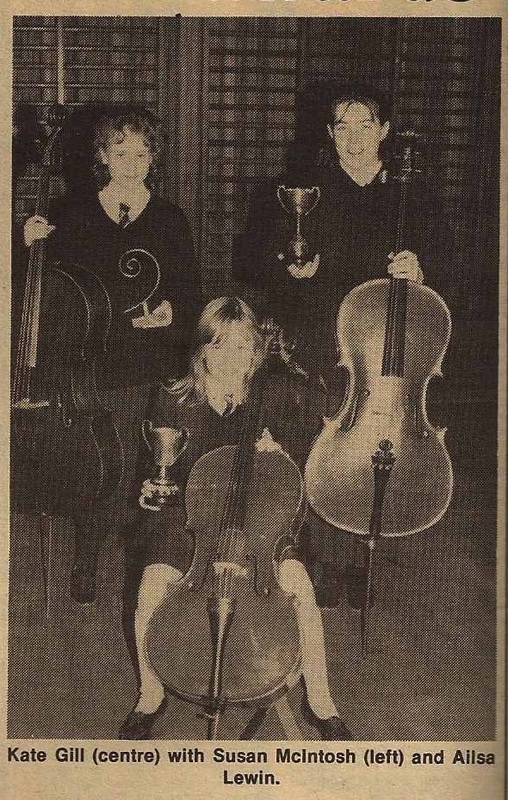 In the individual classes, cellists from the school came away with three trophies between them. Kate Gill (10), was awarded the Gabrielle Lavelle Trophy for cellists age 12 years and under. Susan McIntosh and Ailsa Lewin shared the Tanya Smith Trophy for the open cello solo class. Alisa Lewin was awarded the Lewis Powell Trophy for her performance of the Haydn cello concerto in the open string concerto class. Pic caption: Kate Gill (centre) with Susan MCintosh (left) and Ailsa Lewin.